More photos available in the diary. Second day. On Monday I woke up very early in the morning, so I was able to be at Sant'Antimo Abbey at 7 AM, with the magic light of the morning. This church is one of the masterpieces of Romanesque architecture in Italy and it's my centre of the world. I “discovered” it many years ago, when I was still a boy, and at that time only a few people knew it. 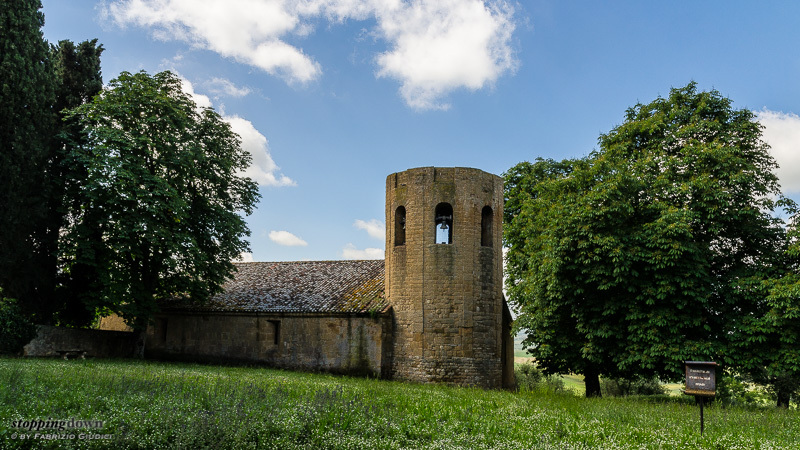 The experience of visiting it in silence and loneliness is something unbelievable and unfortunately it became a rare gift since when mass tourism has included the abbey in popular tours. Unless you get there early in the morning... Monday there were only a German photographer, a few monks celebrating the Lauds and me. The apse, facing east as it was a common architectural design for churches in ancient times, was shining in the morning sun. Una mattina di maggio a Sant'Antimo. Nikon D7000 + Nikkor 18-70mm ƒ/3.5-4.5G ED DX AF-S @ 70 mm, 1/200 sec @ ƒ/11, -1.33 EV, ISO 200, hand-held. 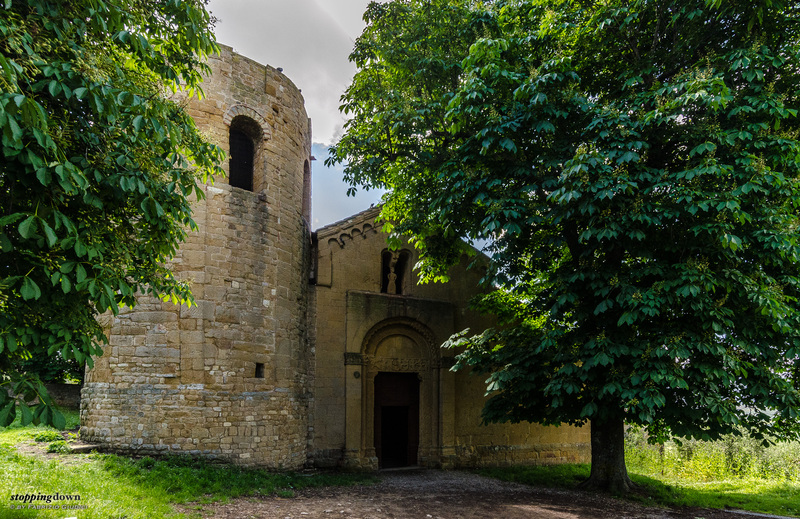 The landscape around the abbey is delicious, with the cypress trees, the vineyards, the sweet hills and the nearby village of Castelnuovo dell'Abate. Since the past year I've been trying to portrait a wide portion of it with the fish-eye, possibly with a low-on-the-ground point of view, near the fresh green grass. Two attempts, the latest one just earlier this May, failed because of the bad weather. So you can imagine my happiness in being able, at last, to realize a decent interpretation of this idea - even though I had to give up with the low point of view, since the grass had grown too much and in a messy way. And too bad for the sky, still empty since the past evening. Nikon D7000 + Samyang 8mm ƒ/3.5 fish-eye II @ 8 mm, 1/200 sec @ ƒ/11, -3.00 EV, ISO 220, hand-held. 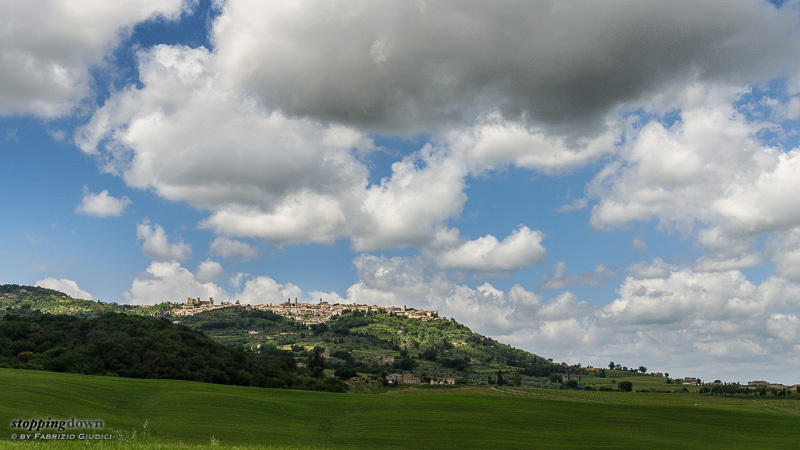 Back to San Quirico, I drove towards Pienza, while a few clouds started to lazily populate the sky. I took again shots of the sweet landscape alternating wide angles to long lenses. 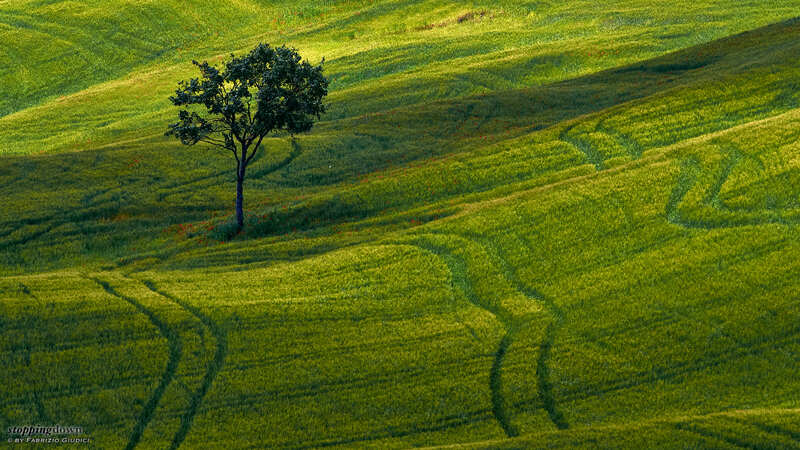 Tra San Quirico d'Orcia e Pienza. Nikon D5100 + Nikkor 18-70mm ƒ/3.5-4.5G ED DX AF-S @ 18 mm, 1/160 sec @ ƒ/11, -0.67 EV, ISO 110, hand-held. Nikon D5100 + Nikkor 300mm ƒ/4D ED-IF AF-S @ 300 mm, 1/640 sec @ ƒ/8, -1.00 EV, ISO 160, hand-held. In the meantime the sun was getting higher and the soft morning light was going away. Pienza was lazily resting on its hill slope, confounding its skyline, the bell tower in evidence, with the silhouette of surrounding trees. Downhill, the gaze towards Monte Amiata was getting lost in the slightly hazy atmosphere. That vision was characterized by a strong backlight, so I was dubious about a good outcome on a photo. Nevertheless, as I previously wrote, post-processing sometimes does miracles, and in fact I pulled out a decent portrait of the scenery in front of me. Nikon D5100 + Nikkor 18-70mm ƒ/3.5-4.5G ED DX AF-S @ 29 mm, 1/320 sec @ ƒ/11, -0.67 EV, ISO 125, hand-held. Just beyond the village of Pienza, another jewel of italian Romanesque can be admired, the Pieve di Corsignano, with its peculiar round bell tower. The façade was partially hidden by two majestic horse-chestnuts and in backlight, so I waited for a passing-by cloud to obscure the sun and minimize the harshness of the light before taking a shot. Nikon D5100 + Nikkor 12-24mm ƒ/4G DX AF-S @ 12 mm, 1/500 sec @ ƒ/8, -2.00 EV, ISO 720, hand-held. Nikon D5100 + Nikkor 18-70mm ƒ/3.5-4.5G ED DX AF-S @ 18 mm, 1/250 sec @ ƒ/11, -1.33 EV, ISO 200, hand-held. 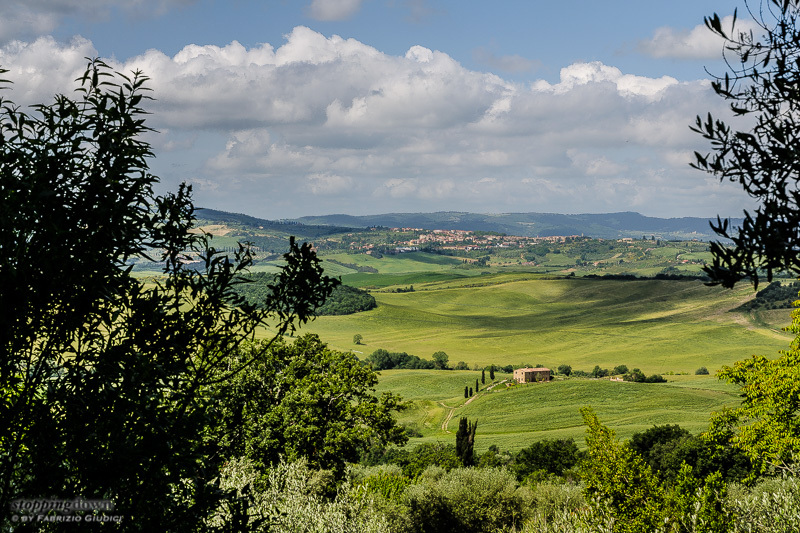 Looking through the foliage, a refreshing view of the hills below Pienza could be enjoyed, up to San Quirico. Clouds, that in the meantime were again numerous as in the previous day, were enhancing the landscape with their shadows running on the slopes. San Quirico visto dalla Pieve di Corsignano. Nikon D5100 + Nikkor 18-70mm ƒ/3.5-4.5G ED DX AF-S @ 50 mm, 1/200 sec @ ƒ/11, -1.00 EV, ISO 100, hand-held. 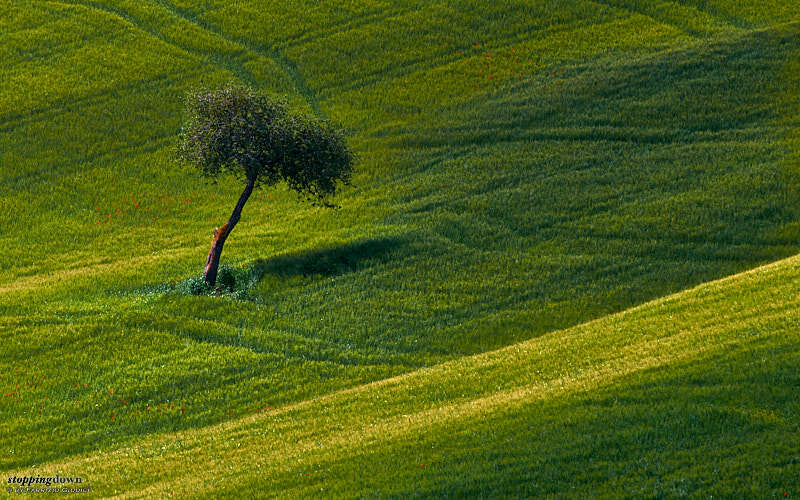 Lonely trees are a popular photo subject in Tuscany, and they don't need to be a cypress. 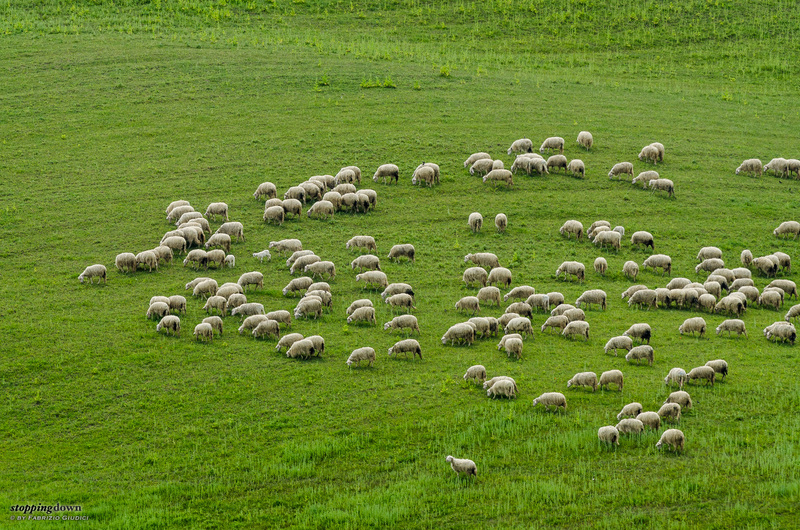 A long lens is great for capturing such details, as they often can be found in unreachable places, such as private estates or pastures guarded by sheepdogs. Nikon D7000 + Nikkor 300mm ƒ/4D ED-IF AF-S @ 300 mm, 1/400 sec @ ƒ/11, -0.67 EV, ISO 320, Kirk Enterprises Window Mount. 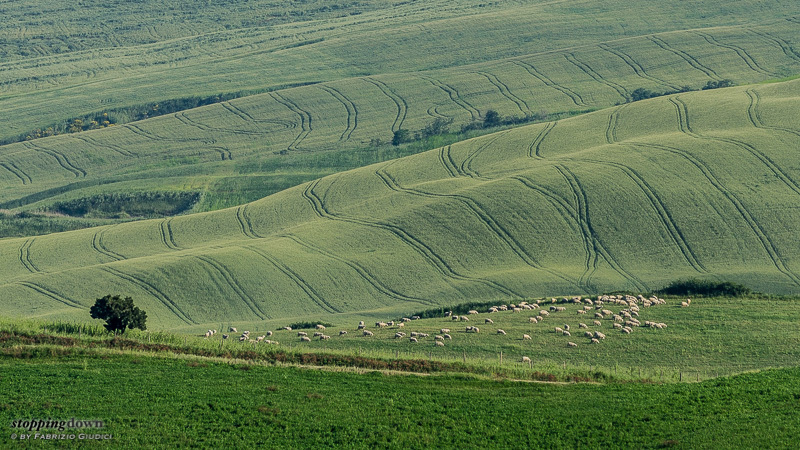 Apropos of pastures... Val d'Orcia has got many: “Pecorino” cheese is indeed one of the most famous products of Pienza. So it's easy to run into flocks while sheep are creating the premises of the production of such a great food. Nikon D7000 + Nikkor 300mm ƒ/4D ED-IF AF-S @ 300 mm, 1/200 sec @ ƒ/11, -0.67 EV, ISO 220, Kirk Enterprises Window Mount. And then midday came. Time to reluctantly take the road home... but still stopping by other jewels around the path. The village of Montalcino, perched upon his hill from which its fortress dominates Val d'Orcia, was shining under the sun, again in a game of lights and shadows. Nikon D5100 + Nikkor 18-70mm ƒ/3.5-4.5G ED DX AF-S @ 31 mm, 1/500 sec @ ƒ/11, -1.00 EV, ISO 100, hand-held. 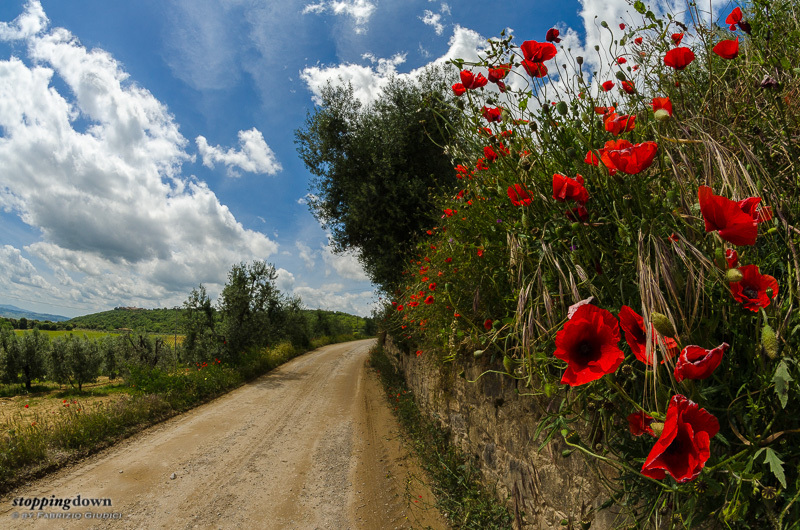 Along the last part of a white road leading out of the valley I got to a marvellous wall, literally covered with poppies. This is one of my favourite subjects, which I recurrently exercise with, being never satisfied of what I get. The idea is to get the poppies in their context, giving focus to a few flowers in foreground, having a blue sky with soft clouds in the background, the white road in evidence, the strong and contrasted colours of midday. I don't know whether there are such picturesque corners in a closer place to where I live, but my impression is that those in Tuscany, and specifically in the province of Siena, are peculiar; this means that I have only a few chances per year with this subject, and in the past there was something that always went bad: the weather, the light, an unsatisfactory perspective. Instead, this year everything seemed to favourably align. With the fish-eye I got very close to a bunch of flowers, searching some that were facing to me, and the dramatic perspective created by this lens enhanced the size differences between the foreground and the background; it made me able to capture the poppies-in-the-context shot I was longing for since such a long time. You can find more photos, including some along the road to Val d'Orcia, in the diary. Nikon D7000 + Samyang 8mm ƒ/3.5 fish-eye II @ 8 mm, 1/320 sec @ ƒ/16, -2.67 EV, ISO 220, hand-held.